Following rave reviews in the initial trial markets, starting December. 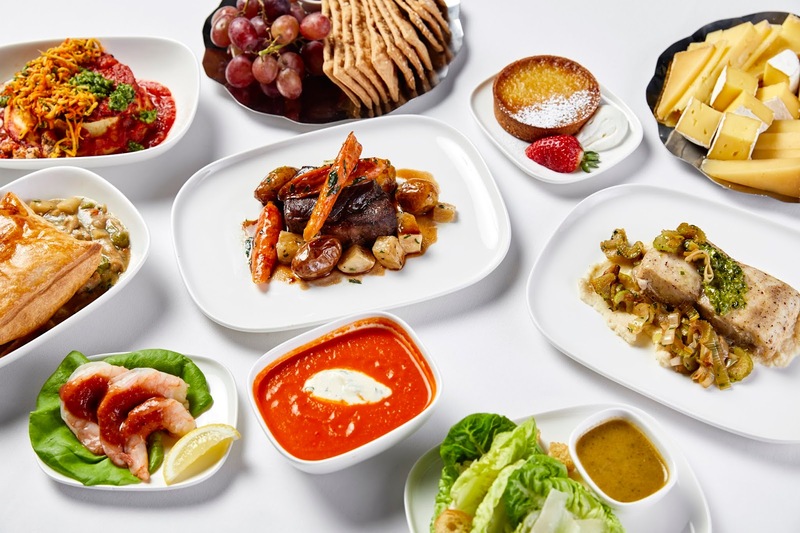 6th, Delta will expand its popular pre-select meal program to include all outbound and inbound Delta One routes, offering pre-select on flights to customers travelling between the U.S. and Europe, Middle East, Africa, Asia and South America. Pre-select is also available on long-haul domestic routes where Delta One is offered. * As of Dec. 6, pre-select will be available in more than 200 markets around the globe. Starting December 6th, Delta will expand its popular pre-select meal program to more than 200 markets across the globe. Customers in eligible markets will receive an email from Delta three days prior to their flight, asking them to select their first choice meal. All that’s needed to participate is a valid email address, listed in the customer’s SkyMiles account or in their passenger record. Customers flying in Delta One will enjoy comforting winter dishes on board starting Dec. 1, like Chicken Pot Pie with carrots, celery, English peas and puff pastry. Delta will also be dishing out customer favourites like Jon and Vinny’s Marinara Braised Meatballs with bianco DiNapoli tomato, garlic bread and Gioia whipped ricotta. Depending on the destination, menus will feature culinary creations by Delta’s in-house and partner chefs – like James Beard honoree Linton Hopkins out of Atlanta, Danny Meyer's Union Square Events out of New York, and chef duo Jon Shook and Vinny Dotolo out of L.A. Customers travelling between the U.S. and Asia can look forward to new, regionally-sourced menus curated by chefs Jereme Leung, Japanese chef Norio Ueno and Korean chef Kwon Woo-Joong. The refreshed Delta One menus will be complemented by a selection of wines curated by Delta Master Sommelier, Andrea Robinson. Andrea’s wine selection is a year-round process that includes in-flight tastings to make sure the wines taste just as good at cruising altitude as they do on the ground. The menu rotates throughout the year to pair perfectly with the latest in-flight meals. To enhance the onboard experience even further, Delta partnered with Andrea to develop its Sky Sommelier program, a series of online courses where flight attendants learn how to bring the wine experience to life for Delta’s customers. Delta is also serving new offerings in its Flight Fuel menu for customers in the Main Cabin, including a new Protein Box boasting 22 grams of protein and two new healthy and wholesome Luvo chicken wraps under 500 calories each. Delta’s domestic First Class and Delta Comfort+ snack baskets have been refreshed with new options for customers to enjoy, including the world’s top selling cookie – the Oreo. In addition to offering bananas and the airline’s Main Cabin complimentary snack line-up, the refreshed snack baskets now feature customer favourites and seasonal selections like SunChips, Oreo Peppermint Bark and Erin Baker’s Pumpkin Spice Cookie.